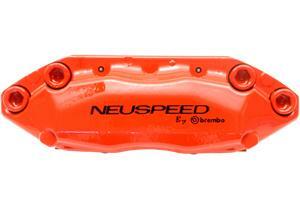 NEUSPEED Brakes - Grand Turismo Kit - Dezod Motorsports Inc - Home of the automotive performance enthusiast since 2002. The NEUSPEED/Brembo Gran Turismo brake upgrade is a simple bolt on affair with its clear and detailed installation instructions. All hardware needed to get the job done are included. 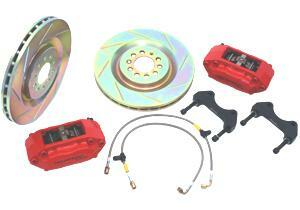 This kit features oversized slotted rotors, four piston red NEUSPEED/Brembo calipers, billet aluminum caliper brackets, new stainless steel braided brake lines, and hi-performance brake pads.